Choose a charming contemporary item with the Trevi Dining Chair Charcoal, a marvellously modern piece for your dining area. Sleek and minimalist, the Trevi is a beautifully simple design that delivers style and efficiency in a desirable package. 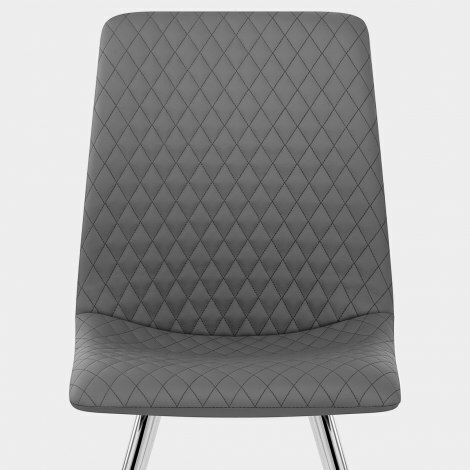 Stylishly clad in charcoal faux leather, the seat has an intricate diamond pattern across the front for a striking focal feature. Plus, the dense padding within the seat and high backrest provides supreme comfort. Tapering out from underneath the seat, the four legs have a delightful chrome finish that reflects the chairs surroundings. With anti scratch floor protectors beneath the legs, it is also great for all types of flooring from wood to tile.